On one of the several wonderful days we had at Casimir last week, we loaded Henry in the car and drove up to White Marsh. We had previously arranged to go to a new store there called, RideMakerz. If you've not heard of RideMakerz, the concept is similar to the Build-a-Bear idea. Kids can go in to the store, pick their car or truck, choose their sound, tires, hubcaps, chassis and accessories. They're outfitted with little assembly stations and the kids can put the car together. You register, get a 'title' and a license plate and if you're really in the mood to go all out, a remote control. The assistant manager agreed to meet us an hour early in order that Henry could make his ride without the threat of germs from nearby 'mechanics'. We circled the edge of the store several times, sizing up the mini coopers, dump trucks, race cars and others. In the end Henry settled on a fire truck with a monster truck chassis. I think the available siren sounds tipped the scale for him. He had a great time assembling it and an especially great time playing with it on the floor with the assistant manager. Our attitude toward toys has loosened a lot lately. Normally we wouldn't have considered buying an item like this for a three year old. The experience of building it and the smiles it brought were worth so much and we owe that to the considerate and thoughtful management at RideMakerz. Not only did they open the store for us. Not only did the assistant manager engage Henry and play with him on the floor. 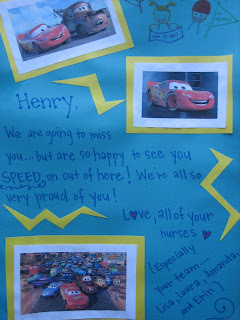 Not only did they provide a terrific memory and generate smiles for Henry. But they wouldn't accept any payment for it. Thank you RideMakerz and specifically, thank you Jordan. You made Henry's day! Our family has been the object of so much giving, much of it by family and friends. The generosity of strangers is such a wonderful surprise and reaffirms that there is an awful lot of good in the world too. By the way, while there are only 7 stores in the country now, there is one in Hagerstown on Garland Groh Blvd near the new Best Buy. If you've got a special little boy in your life, it's definitely worth a visit! We were released from Hopkins yesterday after an uneventful visit. We are asked similar questions each time regarding Henry's health, and lately (and fortunately) we've nothing to report. He's not quite eating as much as we'd like, but it's ramping up. During our visit yesterday he polished off two bags of his favorite 'orange' potato chips! The doctors left the room and Henry's first question was, "does that mean we get to go home?" After saying 'Yes', he hopped off the bed and did what we're now calling his 'Wohoo Dance'. So after only three days and two nights at home since February 15th, Henry will be coming home on Friday. At his last clinic appointment, we expressed our surprise at Henry's recovery, telling the transplant specialist that we just didn't know what to expect, but that we were really pleased. "We know what to expect and we're really surprised." So it seems that Henry has been on the exceptional end of a quick recovery from this last round of chemotherapy. The doctor also said that it's "ridiculously early" to be sending us home, but he sees no reason for us to have to stay nearby longer than the end of the week! Anyway, we're enormously proud of him for his spirit's ability to return to his life as a three year old boy so quickly and flexibly. We are grateful for his body's ability to do the same. And I have to think the healing will only progress faster when we return home. I've stolen away to the Safeway grocery store near St. Casimir's to make use of their internet connection. Henry has been doing absolutely terrific right now. He's already eating on his own without the aid of his internal feeding. Occasionally we notice that he's unable to hear a sound here or there, but nothing severe. His counts are beginning to rebound as expected. His sisters are down for a long weekend with Grandma Linda and he's been having a ball. He's ridden his bike, taken walks, played hide and seek, learned to jump (yes - he's catching air!) and seems to have simply boundless energy. He's not fussing when taking his medicine which, along with flushing his catheter daily, are the only things we have to do now for maintenance. 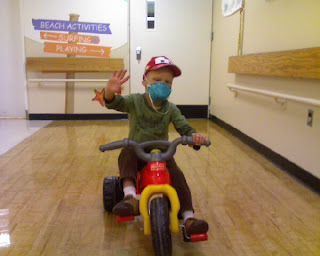 We make two or three trips per week to the clinic to check his blood levels and give him any blood products he needs, which to date has only been one unit of platelets. None of us would have ever guessed that less than several days out of the hospital he would be running and jumping! He's truly enjoying life right now as are we all. Along with his health, the weather has commensurately improved, spring is in full bloom and warmer days are allowing some outside play. So for the time being we will forget that our fight is not yet over, that we still must discuss radiation therapy, that this isn't yet a 'cure', that his prognosis is still difficult to realize despite his current mood and behavior. For now we will bask in our sunny, warm, happy days and be ever so grateful for them. Let's get the Scheck outta here!! We're off! St. Casimir's is lovely, but has a particularly spotty internet connection, so updates may be less frequent for the next couple of weeks. We interrupt this regularly scheduled month of chemotherapy and recovery to tell you that we now expect to be discharged from the hospital TOMORROW!!! Henry is doing so well that the doctors feel that it will be safe to get him out of the hospital. We will of course be staying at St. Casimir's until they feel that it is safe for him to be 90 minutes away. We are absolutely thrilled, and quite surprised. They hinted last week that it might be earlier than we expected, but we never dreamed it would be this soon. Henry is eating, albeit it unpredictably. We'll go home on IV nutrition again, but we're pros at that one. He'll need one additional IV medication to help boost his immune system, likely just for a couple days. We'll have frequent clinic visits, at least 3 days a week, again. We also expect to be busy with new doctor's appointments, too, to assess what needs Henry will have now that chemo is done. We expect his next MRI to be around mid-May. We will truly miss the wonderful nurses and staff that we have gotten to know here. Many of them are very special people and have made a difficult experience much easier. But frankly, the list of things that we won't miss is a much longer one! Henry had a great day yesterday. I arrived to relieve Tara just after my mother and Sophie had come in with Chick-fil-a. Sophie and Henry were happily playing on the floor. We had a couple of special visitors for the afternoon come by as well and shortly after their arrival, Henry was unhooked. He led us all on a trip down the elevator and played in the halls of the children's hospital. Everyone that sees him is amazed by his energy. He rode his mogocycle for such a long time and then had energy to spare for playing trains, garbage trucks and for making s'mores (the chocolate was his favorite). There weren't any outbursts this afternoon. No furrowed brows, fits or accusing looks. Just happy Henry. He was relaxed and smiled and laughed and played like any three year old. It was so healthful to watch. It was his best day in a long time. What You Gonna Dream About? The last few days in the hospital, while certainly not anything that could be measured as 'normal', have been rather uneventful. This is a very desirable characteristic of a hospital visit of any kind, but it makes for long days. Henry is doing very well right now in terms of the side effects of his chemotherapy. He has surprised the doctors with how active he has been. In fact yesterday after receiving both blood and platelets, it was like he had the energy of several three year olds! His stamina took him around the floor several times on the bike, then on foot. This from a child whose last chemotherapy regimen left him weak and in need of practice to walk again once out. We're so pleased right now. One of the quirky things that Henry takes to in his less active and fatigued times is resorting to an arsenal of questions and idiosyncrasies that are in no uncertain ways like water torture. Here are a couple of examples. The need to let the sheath on the temperature gauge fall completely to the bed before retrieving it. He must hang up all telephones at all times. He must be the one to operate the room remote. This includes the light, the TV, the volume and the nurse call button. Requiring us to 'help me hide' before we leave the room so when we return he can 'surprise' us. Every time. My personal favorite...The need to hold up a special stop sign to indicate when he stops peeing in the urinal. Yesterday a quacking duck had to accompany each diaper change. Each of these things must happen. If not the offender will be summarily punished with an outburst of spectacular proportions. Occasionally the offender is not made aware of the requirements before a new rule is introduced as the other day when I helped him blow his nose. Now this is something that we've done for him forever. Somehow I did not perform this ritual exactly as expected and he went nuclear. Now of course we understand that these are his ways of exerting control over an otherwise awful situation. He's practically locked in a 15 x 20 room for almost the entire day over the course of three weeks. He is prodded every 4 hours for vital signs. He's made to take nasty tasting medicines, awakened with stomach cramps and while he may feel like eating, his body isn't always on board with the idea. Of course he also asks at nighttime, "What are you gonna dream about?" and we have a short discussion about the sweet things that he's going to dream about. His dreams usually involve his daily visitors, his sisters, his grandmothers and occasionally about his toys. Last night when I returned the question, he replied "I'm going to dream about Gramma comin' to visit me." "One of these days Henry is going to realize that he just had a stem cell transplant." Bryan and I are thrilled at how well Henry is doing. We still have several days left until his stem cells emerge as white cells in his blood system, so we're far from out of the woods from this round of chemo. However, at this point last month he was very very sick, and we expected the same this time around. His temperature is inching up, and his antibiotic coverage was broadened last night. He is complaining of some abdominal pain intermittently, and having frequent watery stools, but this is just a whisper of how sick he was last month. Thanks so much to the many many people who are continuing to remember Henry. We've had gifts and visitors and phone calls, and they all make him smile. Yesterday was yet another active and playful day for Henry and today is shaping up to be the same. Tara reminded me this morning that at this time during the last cycle, Henry had the beginnings of his rash and the coughing that preceeded his mucousitis, and was on morphine for pain. Every good day now feels like we've dodged a bullet. We're crossing our fingers for the time being, but I'm not sure we can hope for too much more for too much longer! Henry's had a great day. He's had some great play time, both with his sisters and his favorite babysitter in the world who came down to visit some today. He's got some new decor for the walls, courtesy of the Butterflies, Ladybugs, and Zoo Crew from The Learning Center (thanks, guys!). We suspect the chemo will be catching up with him soon (his white count was almost zero today, and surely will be tomorrow) but it's been great to have such a nice day! Following the same pattern as his last high dose round, Henry burst into his more normal self after being unhooked yesterday. His new medicines seemed to rectify his high blood pressure and some stability enabled the monitoring equipment to be removed and Henry roamed free for most of the day. My mother volunteered for an overnight and as Henry has not yet had any symptoms of mucositis, which really makes nights hard, we opted to take her up on it. The mantra for overnight was 'teamwork' as Henry needed to 'coach' Grandma Linda through the overnight vitals. Henry: I love you all the way to the moon and back. Grandma Linda: I love you all the way to the moon and back twice. Henry (pausing thoughtfully): I love you all the way to...Casimir! Grandma Linda: I love you all the way to Kansas! Henry (with mouth open, eyebrows up and hand on face): Oh!! Today was an eventful day. Henry received his second stem cell transplant. This is the second treatment of this sort which is intended to give his immune system a much needed boost in light of it's destruction from the high doses of chemotherapy agents. Henry had some high blood pressure and a low heart rate immediately prior to his transplant which caused a bit of concern and delay in administering his stem cells. There are several possibilities for this, most likely of which is simply a reaction to some of his medications. They are treating it now by removing the suspected drug and additionally supplementing with platelets in the less likely case of some sort of internal bleeding. This causes some increased anxiety for Tara and I and we're hoping that this resolves itself quickly. On top of all that excitement, and in an effort to keep the endlessly long days at the hospital amusing and distracting for all involved, Tara and I came up with the idea of themed days. After today's success of our first theme day, Pirate Day, we may yet attempt more. We may have to ask the nurses, doctors, and child life specialists if they can take it before we attempt another as today they all had to don eye patches, talk like pirates, assist with a treasure hunt and most importantly sword fight with Henry. While on the surface this was a game, it really warms our hearts to know that the team here bends over backwards to help these kids any way they can and they have our eternal gratitude. Now, after repeating his mantra of "I'm really not tired." over the course of the last hour and a half while yawning voraciously, Henry has fallen asleep. Tonight will involve the above mentioned platelets being administered as well as some more attentive monitoring to ensure his stability. Because the combined Pirate Day (fun) and Transplant Day (a bit stressful) kept us so busy today, we're hoping for smoother sailing tomorrow. Today, with very little fanfare, Henry finished his last dose of chemotherapy, hopefully forever! We're so proud of our little man. The carboplatin that Henry has gotten is a chemotherapy medicine that works particularly well for medulloblastoma. It can cause hearing damage in some people, and it is the presumed cause for Henry's current mild hearing loss, which doesn't affect normal spoken conversation. Because of it's effectiveness, our doctors advised using it even though we know that he will lose hearing enough to affect him in his daily life. How much it will affect his hearing is unknown, and it can continue to worsen up to a year after exposure, so this will likely be a moving target. We asked how soon we would notice a change, and learned that it is close to immediate. The first sign of loss is ringing in the ears, and as that fades, the hearing loss replaces it. On Sunday evening I was lying in bed with Henry and he put his hand over his ear, then took it away, then replaced it. "I can hear my hand." "Really? What does it sound like?" So he put his hand over my ear, so that I could hear. "No, honey, I don't hear it. What does it sound like to you?" He sat up deliberately, grabbed my head between his hands, and placed his ear directly over mine. "Now do you hear it?" "Yes, honey, I hear it." He was satisfied. Since then, he hasn't mentioned it again. Bryan and I have been testing him here and there, whispering to see if he's missing things. So far, so good. We've been told we can have him tested while he's still here in the hospital. He'll likely need a hearing aid. The last time we saw the audiologist, she suggested that we not rush into one, but instead talk louder and diminish white noise until he's used to it. This made me feel better - I was feeling like we had to get things done right away. I think it makes more sense to let us all adjust first. One more day of chemotherapy remains. His second stem-cell transplant is scheduled for Thursday. After that, we wait for the healthy cells to return. We've been told that the symptoms of immune suppression are likely to be worse this time around, so there's clearly anxiety around that. We'll just take it one day at a time.